What room in our homes do we not “live in”? All rooms are for living, right? Ironically, living rooms can be one of the rooms with the least life. The living room, and formal living rooms in particular, have gone out of favor. With an inclination for casual lifestyle and entertainment, families have gravitated towards family rooms and rec rooms – places to watch TV, movies, or play games. Living rooms have come to feel “stuffy” and go unused. With more space of high value to homeowners, leaving an entire room neglected does not seem wise. From a feng shui perspective, having a room in your home with no life is not wise either. Depending on where that room falls in your home’s bagua, the lack of life (or chi) could be having adverse effects on your life. And especially if it’s the first thing seen upon walking in the door. If you’re not using your living room, the question is, why? Could it be a place you’d enjoy spending time in? If so, it’s well worth the effort to make it a place that calls you in. Create a good flow. Place a table behind the sofa if it backs up to the entrance. Make it homey. Add softness with rugs, throws blankets and pillows. Add some personality. Display artwork and things with special meaning. Bring life to it. Have plants, and décor with lively patterns for visual interest. Create a reason to go in. Lay out magazines or stacks of interesting books; add music. Make it suitable for entertaining. Add a coffee table with a purposeful tray, or a handy bar cart. Set the stage for conversation. Group furniture at 90 degree angles, or around the fireplace. If, after careful consideration, you’ve determined that a living room is just not a space that makes sense for your family’s lifestyle, is there something else you’re in dire need of? Maybe it would make sense to transform it into something new. With intention, it could go from unused (dead) space to a place of energy and life. Maybe a home office, playroom, music room, or library? You decide. Maybe you can help me out. I have been a widow for the last 7 years. I am having a hard time using my beautiful bedroom at night. I seem to fall asleep on the couch. Something is making me uncomfortable to sleep in my bed. 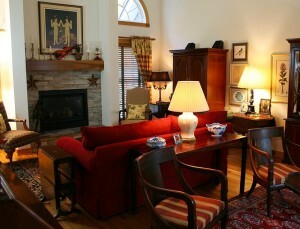 I have used Feng Shui for the placement of furniture and color. It is really concerning me. Do you have a cure for me? Most sincerely, from Rose Marie.